Loyalton sits on the southeast side of Sierra Valley, a huge beautiful valley that was once a lakebed for a lake the size of Lake Tahoe. Maidu and Washoe Indians were the first inhabitants of the valley, coming in the summer to hunt and fish. Jim Beckworth was the first non-native person to discover the valley and the town of Beckworth, at the north end of the valley, is named after this famous mountain man. Everything changed in this area with the gold rush of 1849. More than 16,000 miners came to the county trying to get rich, but most of the miners came to the west side of Sierra County. In the 1850s the Loyalton and Sierra Valley area began to develop as an agricultural and cattle-raising area, and soon logging became one of the major industries. Smith's Neck was the city's original name, but because of their Loyalty to the Union during the Civil War it became known as Loyalton. 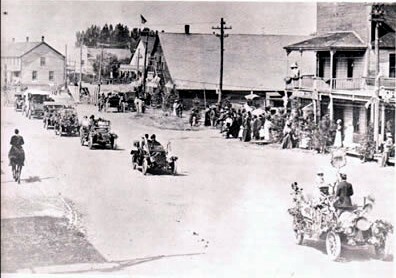 In 1901 Loyalton was incorporated as a dry town and it's size was set at 50 square miles making it the second largest city in California after Los Angeles! Loyalton is still the only city in the county, but is a mere 0.34 square miles. Farming and cattle have always been the biggest industries in Loyalton, as well as logging until the 1990s when the mill shut down and logging all but stopped in the area.